Each season needs a cake. The last cake we shared was this awesome fresh cherry cake with drizzly chocolate ganache. I’d call that an end of summer cake. Out with one season and in with the other, so it’s time for a fall cake! This one is complete with classic fall flavors like apple, spice, and caramel. It’s perfectly moist and delicious and with our baking tips, you’ll be able to make this apple spice cake in your kitchen! The apple spice cake recipe we’re sharing makes one 6 inch cake which I think can be great if you only want to make a 1 or 2 layer cake, instead of a mongo 3 layer cake! 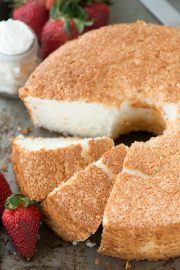 You could also make this cake in an 8 inch cake pan by doing 1 & 1/2 of the original recipe. So you have options! In between the apple spice cake layers is vanilla bean buttercream. I love Rodelle’s vanilla paste because I don’t have to buy vanilla beans and then scrape out the pods because they already did it for me and then jarred it. BOO YAH! 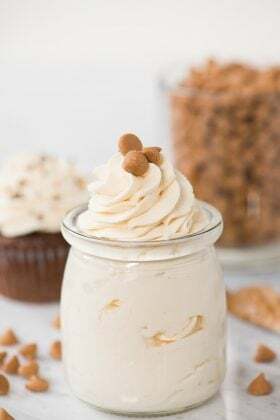 If you don’t have vanilla paste, you can use pods from a vanilla bean, or regular vanilla extract, although the flavor won’t be as prominent. 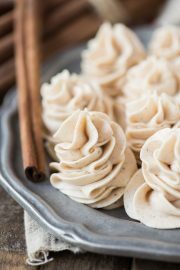 Or skip the vanilla buttercream altogether and make cinnamon buttercream. 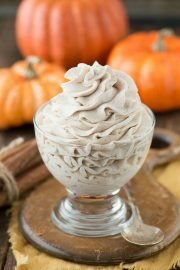 Buttercream is like a blank canvas and you can really turn it into any flavor you’d like. Technically this cake is a naked cake because you can see the cake layers since they aren’t completely covered with buttercream. Naked cakes are fun to make because 1. they can be assembled quickly 2. you don’t need a ton of buttercream 3. they don’t have to look perfect.. rustic is the style you’re going for! The secret to getting the same amount of buttercream in between each layer of cake is to measure the buttercream! 1/4 cup of buttercream won’t be a lot of frosting, so I’ll normally use 1/3 cup or 1/2 cup in between each layer. In a small bowl combine the flour, baking soda, baking powder, salt, cinnamon, cloves, and allspice. Mix well. In a larger bowl, combine the butter and brown sugar. Beat using an electric mixer until creamy, about 1 minute. Add in the egg, beat again with the mixer. Add in the applesauce, mix by hand with a spatula. Gradually add in the flour mixture, mixing by hand until it’s incorporated. Scrape the batter into the prepared cake pan, using a spatula to evenly spread it out. In a mixing large bowl, combine the butter and vegetable shortening, beat using an electric mixer until fluffy, 2 minutes. Add in the vanilla paste, beat using electric mixer. Begin to add the powdered sugar, about 1-2 cups at a time, mixing by hand first, then with the electric mixer. 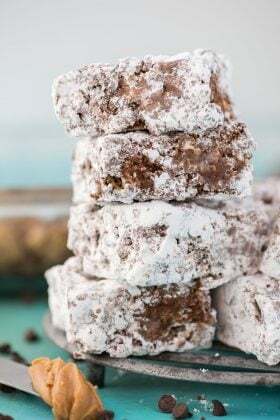 Continue adding powdered sugar until the frosting tastes good to you. Get the directions from Allie at Baking a Moment. I followed her directions, just halved the recipe! She has awesome step by step photo instructions that are easy to follow! 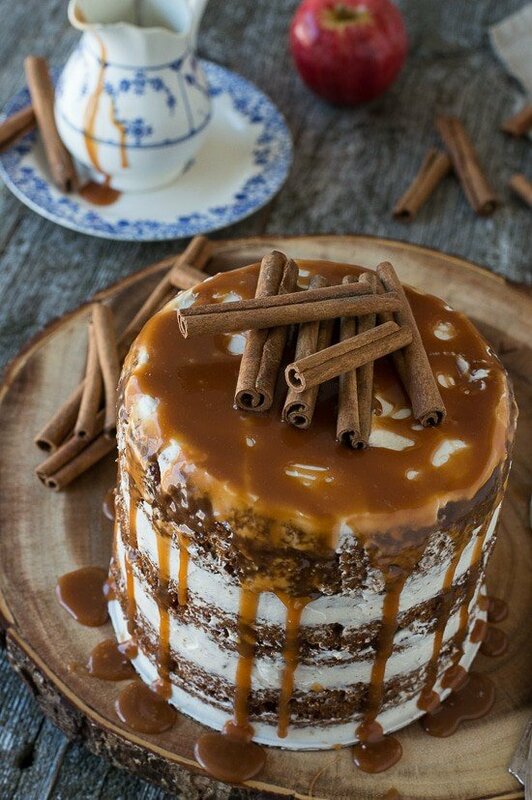 Be sure to prepare your caramel sauce in advance because it needs to cool before adding it to the cake. Spread a small amount of buttercream on a 6 inch round cardboard cake circle. Place your first layer of cake on top of the cardboard. Put buttercream on top of the first layer and spread it as even as possible with an offset spatula. Decide how much or how little frosting you want in-between each layer, you can measure the frosting, I’d use 1/3 to 1/2 cup in between each layer. Repeat this process for each layer of cake. Once all of the layers are stacked and frosted, spread some frosting on the top of the cake. Next, go back and fill in the gaps between the cake layers with more frosting. 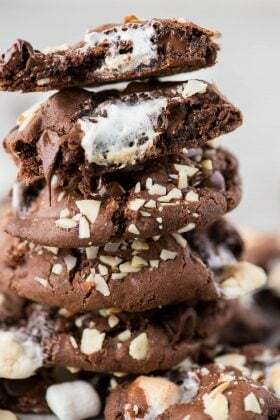 The frosting between the layers does not need to look perfect. Use a small offset spatula to get the frosting in between the layers and to spread it around the cake. Don’t completely cover the cake layers as they are suppose to still be visible. Place the entire cake in the freezer or fridge for 20 minutes to harden the buttercream. 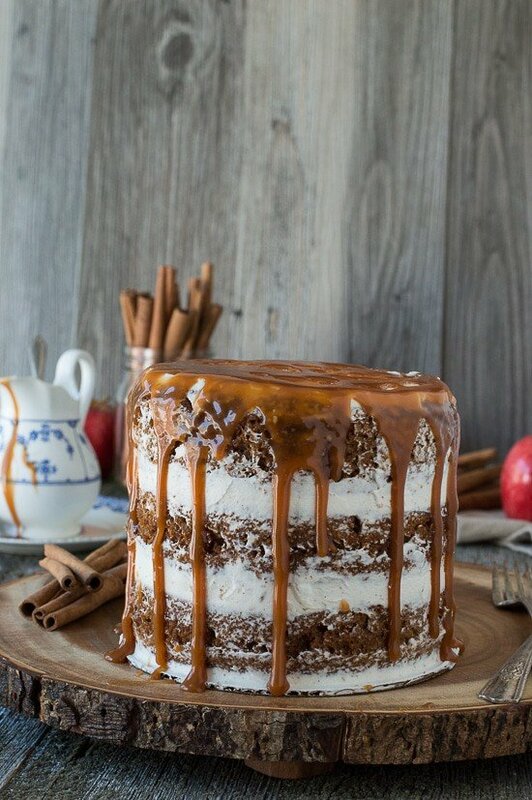 Once the caramel sauce is cooled, use a spoon to drizzle the caramel around the center and sides of the cake, allowing it to drip down the sides. For decoration, add cinnamon sticks or another garnish to the top of the cake. The apple spice cake recipe will make one 6 inch cake. That way you can decide how many layers you want. You could also bake this cake in a 8 inch cake pan by doing 1 and 1/2 of the original recipe, the bake time would increase to 35-40 minutes. You could also turn this recipe into cupcakes. The original recipe might yield between 8-10 cupcakes, I'm not 100% sure because I haven't tried it. I think the baking time would be around 15-17 minutes. Thanks for your sweet comment Cristina! Is it too much to ask for the whole cake to be delivered to me? I sorta want a slice for breakfast…that’s reasonable, right? 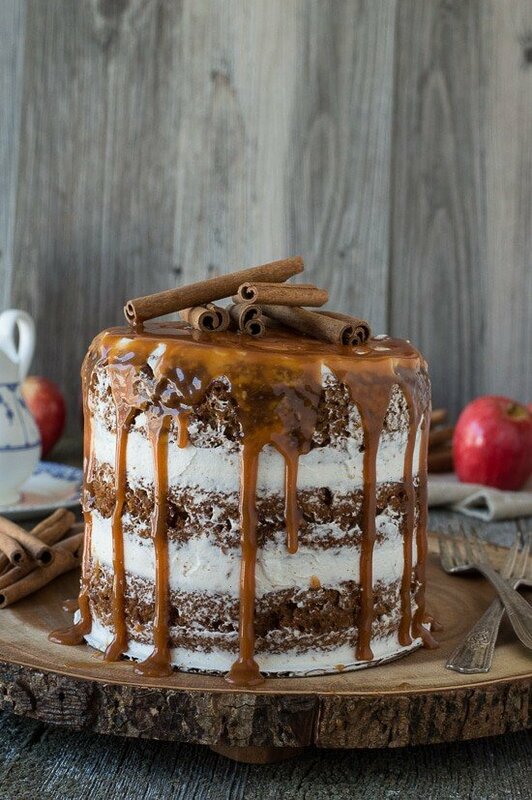 This is seriously the most perfect apple cake I’ve ever seen. I love your talents Beth! Oh goodness, thank you Melanie! This cake is gorgeous, Beth! Love that it’s 6″ and naked. The apple spice and caramel drizzle is perfect for fall! 6 inch is the perfect size I’m figuring out! Naked cakes are absolutely stunning! What a gorgeous way to welcome Fall! We’re ready for fall now! You are the queen!!!! Totally gorgeous and perfect. And you are so good at writing the directions that I think even a novice like me could maybe understand!! Just beautiful!!! Beth this is such a gorgeous cake!!! Oh my goodness. Can I please hire you to teach me how to bake like a proper human being? This is STUNNING. Oh my goodness! This cake is beyond amazing! This cake is stunning! I love the garnish with the cinnamon sticks! Sounds like a lot of people like that touch! Yup, you’re right, every season needs a cake! Love the color of that cake! It’s time for FALL cake!!! This cake is straight up GORGEOUS. The cinnamon sticks on the top – my favorite! What an amazing cake for the fall! This cake looks amazing! 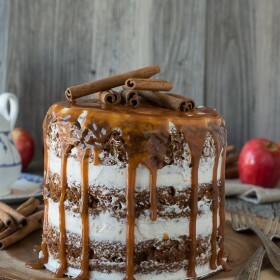 I really like the idea of combining apple with spices, vanilla and caramel all at once! Oh my gosh, this cake is gorgeous! I seriously want to eat it all. Love! Um, this looks amazing. All of your gorgeous tall cakes are making me and my sheet cakes look bad! But sheet cakes are so fun and practical for any occasion! Beth you hit this cake out of the park. It looks amazingggggg! Apples are one of my fave things about fall! Do u cut the 6 inch cake into 2 inch layers? Hi Heather, the cake is 6 inches across, not 6 inches high. Each individual layer is probably 1.5-2 inches high. Beautiful cake, perfect for Thanksgiving. Still not sure though if you cut 3 layers from the cake or made individual layers. I made 3 individual layers. Do we triple the recipe given? Hi Kelli, the cake recipe makes one 6 inch cake. That way you can decide if you want a 1, 2 or 3 layer cake. Hi Beth, just came across your blog and I think I’m addicted! This cake looks amazing. Wondering if I can substitute the apple sauce for stewed apples? I’m in Australia, never bought apple sauce so not even sure we have it here….sounds silly I know. Also thinking stewed apples might make it a little bit healthier as I’m thinking about making for my baby’s birthday. Hi Kristy! I’m not entirely sure how stewed apples would effect the baking and the texture. You could make your own homemade apple sauce by pureeing baked apples until smooth. I was wondering about the amounts for buttercream and caramel. Are those quantities for a 3 layer cake? 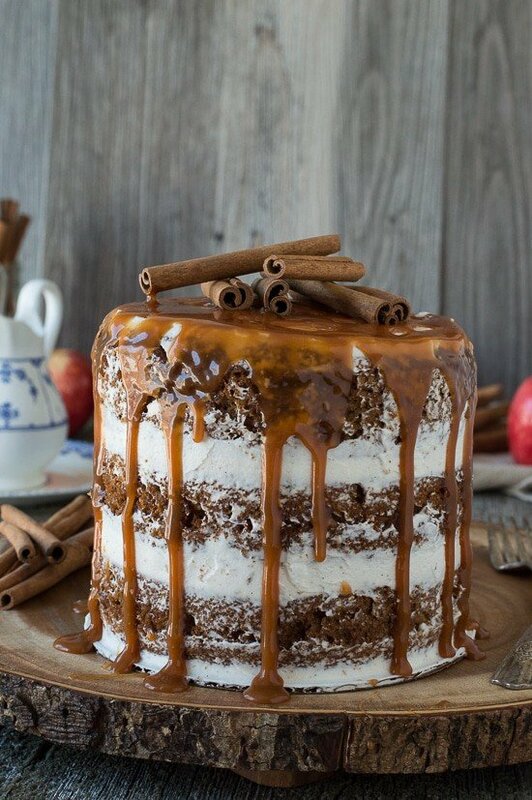 I know that the cake portion includes quantities for just one of the layers so would need to be tripled – is that the case for buttercream and caramel? Great question – the buttercream and caramel recipes will make enough for a 3 layer cake. The caramel recipe will actually make a whole jar! Help me…..I made the cakes tripled them to make a three layer cake ….and both times after cooling the middle sank. It is a wonderful texture and taste just bummed. I baked until the sides were coming away from pan and toothpick was clean. But after cooling the middle sunk and was doughy. Any thoughts. Hi Janeil! What a bummer! It seems like you baked it long enough, if a toothpick was clean. Could you have over mixed the batter? I’m sorry! I tripled the recipe and there was way too much batter for the pans (I used six in pans that were I think two inches high), but I figured you baked it as a three layer and went for it. It took about 35 minutes for the cake to cake and they ended up overflowing. :( I guess I need higher cake pans for next time! I’m so sorry! Overflowing batter in the oven is the worst. I use Fat Daddio’s 6 inch springform pans! Were your pans regular round pans or springform pans? Hi Beth! I used this buttercream recipe for a different naked cake but it was pretty firm, and I only used maybe 4 or 5 cups of powdered sugar. Everything was room temp, it’s about 70 in here…so why would it be so firm? It wasn’t sticking to my cake but was starting to pull crumb off of it. Thanks! Hi Anna! Because you used a different naked cake recipe, maybe that person’s cake recipe was crumbly? Generally some of the crumbs will come off when giving the cake a light crumb coat. The best trick to do if your buttercream is too thick is to add a some amount of water (1/2 tsp) at a time until the consistency is better! Just made the cake tonight, I think I might have gone wrong somewhere (and that’s saying a lot seeing as I’m a baker/cake decorator). Is the apple flavor supposed to be hidden? Are the apples only there for binding purposes? Hi Ashley! The apple flavor isn’t as strong as the spice flavor – I hope you still enjoy it! What a perfect and unique addition to my Thanksgiving this year! I was nervous that this cake wouldn’t turn out, but I followed your directions and it turned out perfect! I doubled the recipe and was able to make 3 – 6in layers for the cake. I will definitely be saving this for the future! THAT is REALLY beautiful! It looks just perfect…im def making it! Am I crazy or did I miss the apples in the ingredient list? Hi Julia! The recipe uses applesauce! Has anyone tried making this in a 13″ X 9″ pan? My granddaughter wants me to make this for her baby shower in October, and my round layer cakes tend to slip and slide. I thought I could double (triple?) the recipe and bake it in a 13″X 9″ pan for about 35-45 minutes, cool, and then frost the top and drizzle caramel over it. I’d prefer the round layers but am afraid it will slide all over. Any suggestions? Hi Beth! I’m excited to try this recipe this weekend. But I’m baking for quite a few people. If I double the recipe and make a larger cake by using a 12 in spring pan, do you think it will work the same? Or should I just stay safe and just make 2 cakes?? I just made this and it came out well. Tastes so good. Thank you for the recipe. If I wanted a stronger apple presence, do you think I could add chopped apples to the recipe or would that add too much moisture to the recipe and throw things off? I wouldn’t recommend adding chopped apples as it would change the composition of the cake batter. 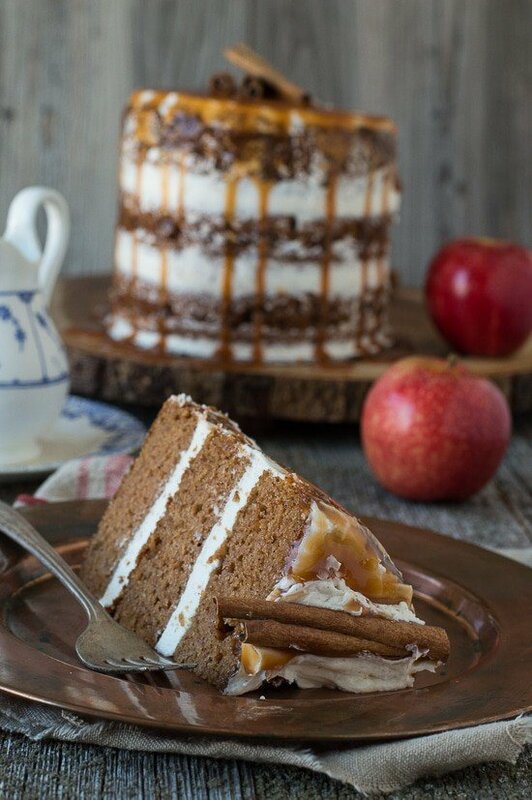 Legit speechless, this apple spice cake with caramel drizzle recipe looks unreal!! I’d love to make this for my family New Year morning. Do you think it would be possible to make this the 30y, let it cool and then seal up and then reheat New Year? Thx for sharing!